Hi Andrea: I really like what you said, you read my mind! Magnets catching indistinctive every kind of objects, without any intention. But we are very selective, that’s what reveal our personality and needs. You asked me if I’m a ‘collector’, and if so what kind of things I collect? And yes, unfortunately, but a “disperse” collector. I use to gather more than collect.I love small objects, old ones, discarded, rusty, forgotten ones. 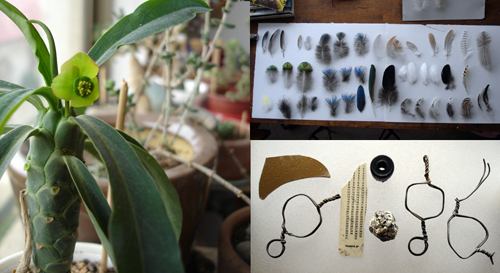 I have a lot of boxes with feathers, bones, hair, buttons, old pictures, eggs, insects, broken porcelain, plastic objects,( I think that’s what most of all, as jewelers do). ….maybe my set of succulents and cactus is my only formal collection. I have been writing 19 copybooks in this last 6 years with drawings and notes…..but, something that I construct can be a collection? Can I collect my thoughts in copybooks? The activity of collecting includes seeking, locating, acquiring, organizing, cataloging, displaying, storing, and maintaining whatever items are of interest to the individual collector. An alternative to collecting physical objects is collecting experiences of some kind, through observation or photography.